The celebration at KALEID Gallery on Friday, April 15, in downtown San Jose will feature five chefs (Laura Stec,Liane Herrick, Joe Gaudet, Jessica Rene Krause and Mike Borgenhagen) cooking from the spring harvest at Veggielution. Some of the produce used: freshly picked kale, radishes, fava beans, garlic, arugula, baby lettuces, beets, carrots and spring onions. The farm’s chickens are even contributing their eggs. Tickets are available for $10 online and at the door. Food tokens will be sold for $3 each to sample some of the chef’s creations, which include Grilled Spring Veggies and Chipotle Hemp Seed Aioli, Crispy San Jose Tofu or Baby Lettuce and hot sauce, Peruvian Purple Potato and Lacinato Kale Galette with Fava Bean and Green Garlic Chutney. Along with the delicious food will be a silent auction of farm-inspired art by local artists. 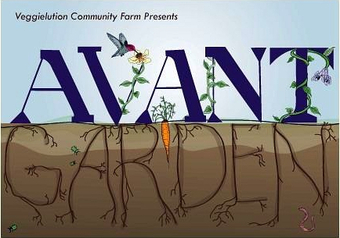 Check out the 20+ artists participating in Avant Garden and a sample of their work here. Friday, April 15, 2011, 7-10 p.m.